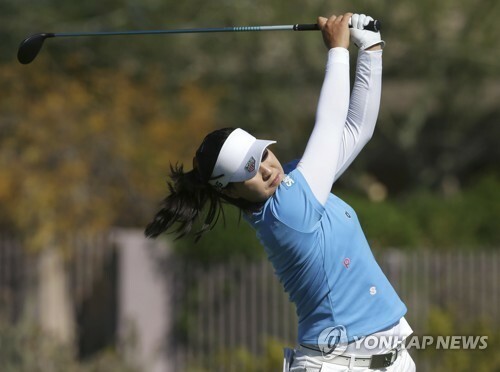 South Korean Chun In-gee has moved up a spot in the women's world golf rankings thanks to a runner-up finish on the LPGA tour. Chun reached No. 3 in the latest rankings announced Monday, behind Lydia Ko of New Zealand and Ariya Jutanugarn of Thailand. Feng Shanshan of China slipped a notch to No. 4. Chun tied for second place with Jutanugarn and American Stacy Lewis at the Bank of Hope Founders Cup in Phoenix, Arizona, on Sunday. It was Chun's second top-five finish in three starts in 2017. Former No. 1 Park In-bee continued her post-injury ascension, rising two spots to No. 7. Park tied for fifth at the Bank of Hope Founders Cup, and won the HSBC Women's Champions in Singapore two weeks ago.